For those of you wondering about my silence on this blog lately, I should let you know that I landed safely back in Colorado last weekend – I’m HOME! But I still have a lot to say about Ecuador, and many blog posts in the works, so stay tuned! Today I want to share a bit about another of my favorite places in Cuenca. I’m one of those lucky people who, mostly, enjoys my job. Given how much time I spend working, that’s a good thing. 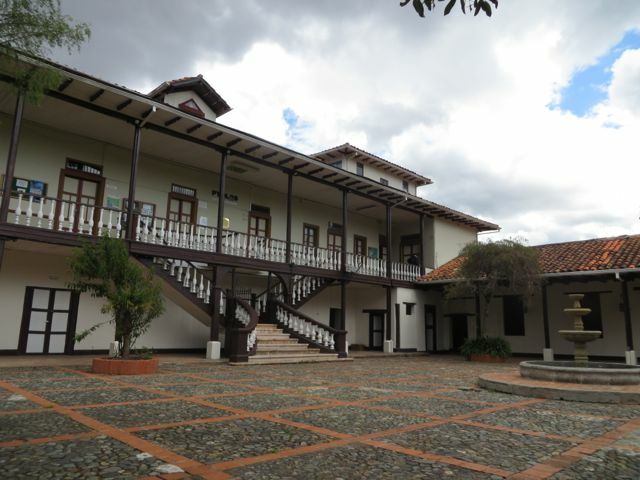 So, for this installment of ‘Favorite Spots in Cuenca’, I felt I had to mention the place in Cuenca where I spent the most time (other than the house where I lived): The Quinta Balzay, a satellite campus of the University of Cuenca. 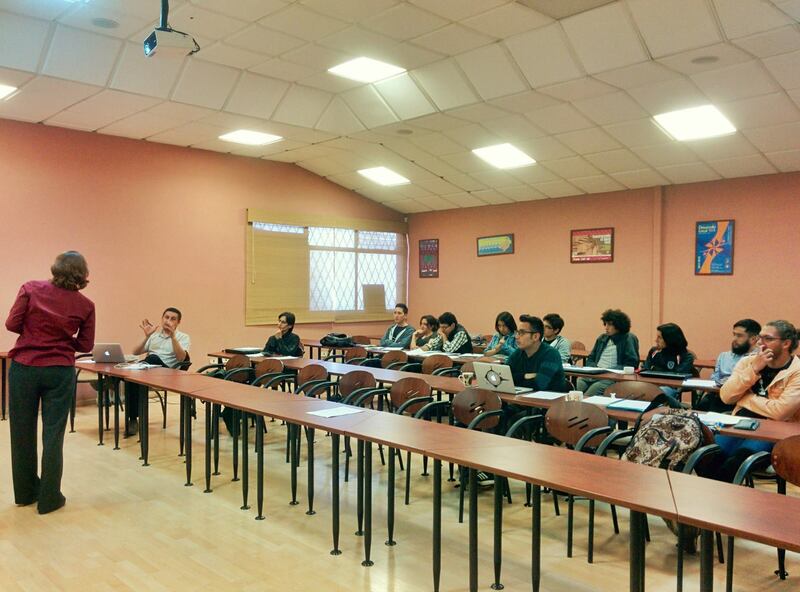 The University of Cuenca is a big school – and growing. 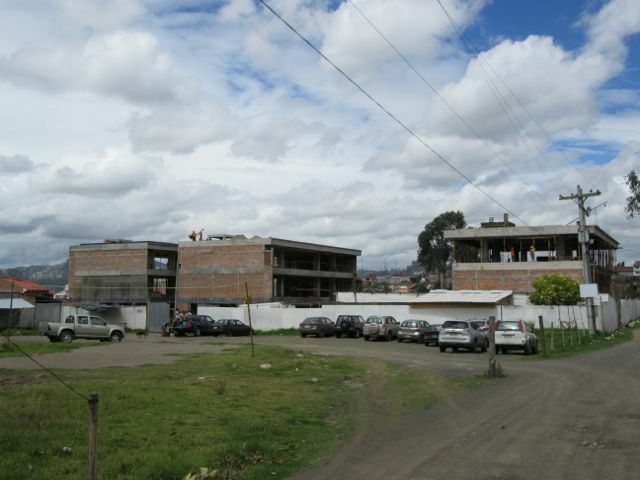 While the main campus is in the center of town, there are satellite campuses scattered around the perimeter of Cuenca. 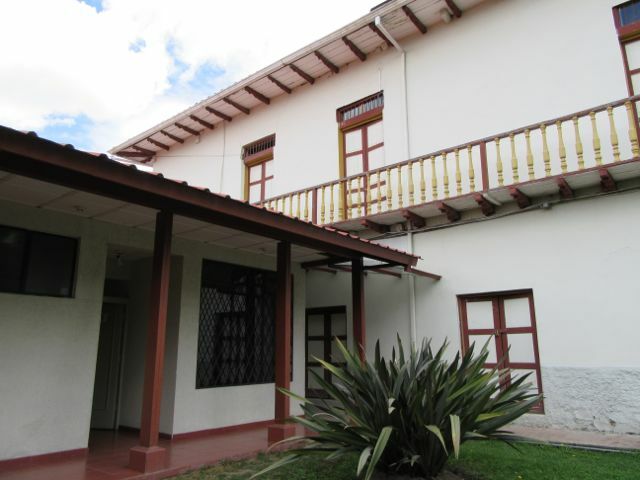 Campus Balzay is located on the western edge of Cuenca, along the Rio Tomebamba, in a well-developed part of town with lots of high-rise apartment buildings inhabited by North Americans. When I found out I would have to ‘commute’ to my office on the edge of town, I was a bit disappointed. I had found a place to live within a 10 minute walk of the central campus. But traveling around town forced me to figure out the bus system in Cuenca, and that turned out to be extraordinarily useful, given how much I hate taking taxis. While I rode two different buses to get to work, each ride was only 5-10 minutes, so overall, my daily ‘commute’ was much shorter that what I normally do in Colorado. It also gave me the opportunity to become familiar with the western edge of town – away from the fray of the city center. I don’t know the history of the Quinta, but it’s an old colonial building with a beautiful fountain in the middle of a cobblestone courtyard. My office was in a cube in a temporary building behind the old colonial structure. Down a dirt (or mud, depending on the day!) road, past the center for research in minerology and behind the orchidarium. The department office has a face-recognition system for entry. (I have to say, it was strange, every time I entered to the office, to see a flash of the photo taken on my first day – it let me see just how long my hair was getting). But despite the high tech entry, like most places in Ecuador, there was no heater or air conditioner. On those rare, sunny, calm days it could get quite stuffy in there. By contrast, in my office in Colorado, we don’t have face-recognition entry, but we do have climate control – or, something that resembles climate control (not that we can ever ‘control’ the temperature – we sometimes find that the A/C has come on in the middle of winter, and the heat in the middle of summer). This office arrangement is all temporary until they complete construction of the big building next door. That’s actually coming along rather quickly. In the six months that I was there, I watched them raise that building by two floors. Unfortunately, that got in the way of the mountain view – but I expect it’s going to be a rather impressive place when it’s finished early next year. 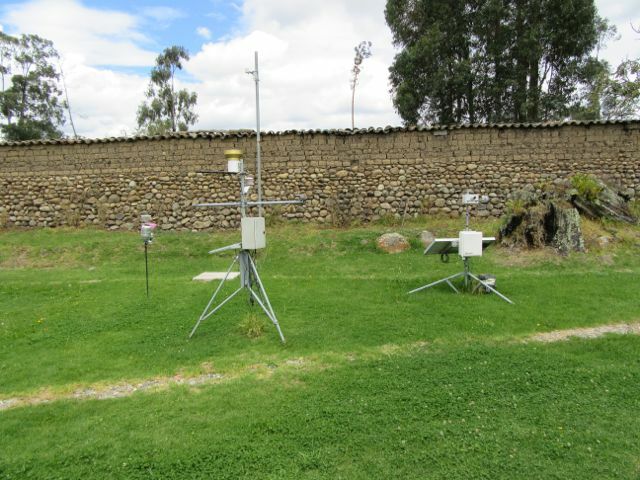 Just outside of our office building, in a grassy courtyard, protected by some of the original walls of the Quinta, was our weather station. The weather station inside the old adobe walls of Quinta Balzay. Despite the rustic exterior of the Quinta, the classroom I taught in was one of the nicest classrooms I’ve used in awhile, with digital projector, a white-board, and decent internet. So why is this place on my list of favorites? First of all, it was peaceful. At lunch time, the campus emptied out pretty quickly. This is an unusual thing for those of us North Americans who are accustomed to a ‘lunch’ that involves grabbing a few bites to eat in between classes and checking emails. Almuerzo (lunch) is sacred in Ecuador. Most people take two hours, then return to the office and work until 6pm. It makes sense to me, to eat the biggest meal of the day at 1pm. But I never fully adjusted to it. Sometimes I went out to a nearby restaurant for a meal, but often, I at my ‘rapid-fire’ North American lunch (apple and crackers) sitting in the cobblestone courtyard for 20 minutes watching the clouds go by (that is, if it wasn’t raining). Sometimes I would go for a short walks along the river after lunch. Back home in Colorado, I often go the entire day without ever leaving my building. Even if I wanted to go out for lunch, class schedules often don’t allow for that. And of course, in winter, I’m not tempted to go outside as much – especially if it’s below freezing. So it was nice to have a place to take break. 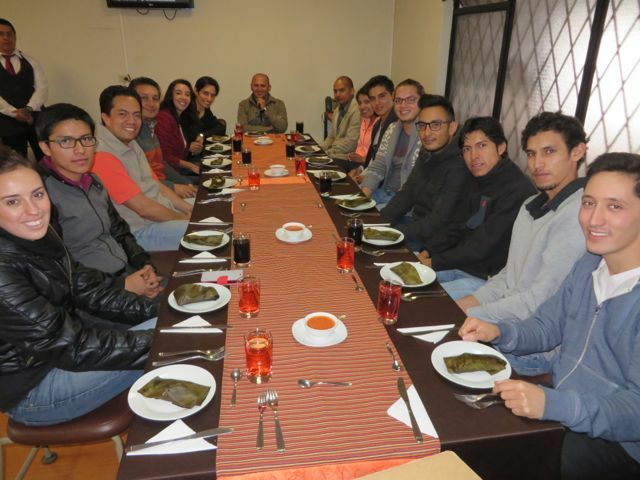 My colleagues and students became my academic family in Ecuador. Teaching is always the best part of my job, and I thoroughly enjoyed working with this group of people – both in and out of the classroom, and all of our discussions in both English and Spanish. I’m so grateful for everyone for making me feel so welcome, and for sharing with me their thoughts and ideas about some exciting research. My academic family at la Universidad de Cuenca, during our lunch celebrating the end of our course in meteorology. There’s so much work that needs to be done to understand weather and climate in Ecuador. 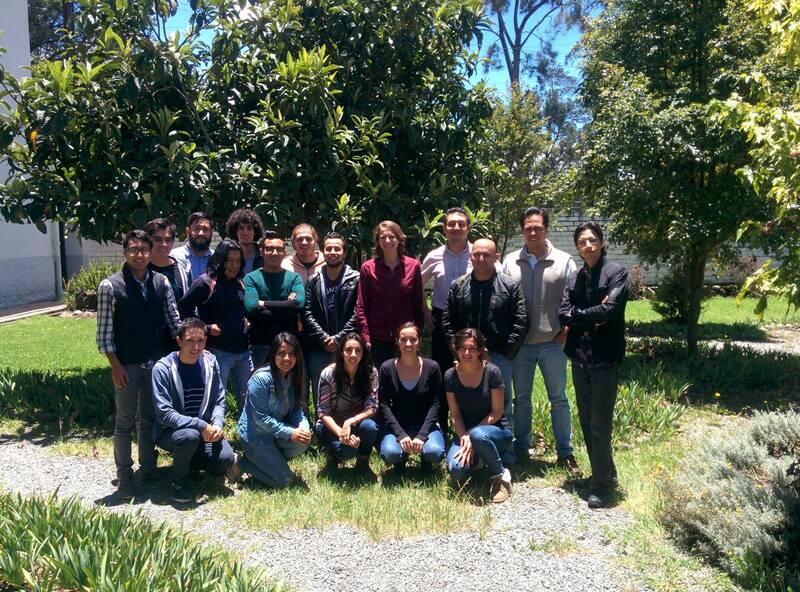 The future of understanding environmental changes in Southern Ecuador lies with these people. I’m so excited for them and the work that lies ahead, and excited to continue working with them. ← Oh, wait…What did I just say? Great memories and good friendships. Sounds like a very successful six months. Glad you got home safely. Welcome home!! Thank you for sharing such interesting insights over the past six months. You’ve made me want to visit Ecuador and I hope one day to see this beautiful country.